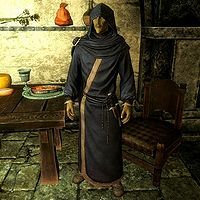 Melaran is an Altmer mage who lives in Erikur's House in Solitude. He can normally be found at the Blue Palace. Although Melaran may not particularly enjoy working for Erikur, it does give him the benefit of having a relatively relaxed life. He will begin his day by waking up inside his quarters on the second floor of Erikur's house at 8am. After waking up, he will proceed to enjoy a one-hour breakfast. After finishing his meal, he will spend the next three hours relaxing inside the house. He can usually be found using the arcane enchanter located inside the house or sitting on the bench or one of the chairs on the second floor of the home. At noon, Melaran will leave Erikur's house to head to the Blue Palace. He will spend the next twelve hours sitting in the lobby, ready to complete any tasks that Erikur may assign him. After a long day of sitting around inside the Blue Palace, Melaran will finally head back to Erikur's house at midnight. He will proceed to enter his room and will then sleep here for the next eight hours. He wears blue mage robes and a pair of boots. He also carries the key to Erikur's house, an iron dagger, a belted tunic, and a selection of upper-class items and gold. Like many of the Altmer, he is rather arrogant and will pass remarks such as: "You are excused." and "I am done with you. You may go." He may also greet you with: "Speak if you must, but mind your tongue. I do not suffer fools gladly." If you ask him if he is the court wizard he will tell you a bit about Sybille Stentor and warn you that: "No. That honor is Sybille Stentor's. A smart man/woman steers clear of Stentor. And keeps himself/herself out of the dungeon when she's having a bad day..." If you ask him to elaborate further he will tell you that: "Let's just say the headsman's axe may not be the worst way for a Solitude Jail prisoner to die." before ending the conversation with: "Look at that. I've told you to watch your tongue and mine is waggling. I've said enough." However, if you kill Sybille and ask him if he is the court wizard, he will tell you: "Now that Sybille Stentor is out of the picture, I am indeed. And the court is, well... free of her... eccentricities. Moving into her quarters was an interesting process." If you ask him about his day job he will tell you that: "I make sure Erikur keeps breathing." before adding "Working for Erikur may be below my stature, but the compensation is... acceptable." If Erikur is dead, he will instead tell you of his new position as thane: "I provide my wisdom and insight to the court." However, if Sybille is dead, the following dialogue will override the other two pieces if both Sybille and Erikur are dead; you will instead be able to comment that a place at court suits him, which he will affirm: "It does indeed. You know, I hear you had something to do with Sybille Stentor's demise..." before continuing with a reference to her vampirism: "That must have been a hard bit of business. I hear Stentor had been alive for a long, long time." He seems to have a certain level of respect for the court wizard as he can often be heard remarking that: "Sybille Stentor has a grasp of magical theory that I would never have expected from a human. Even a Breton." Asking him about magic will cause him to remark: "Oh, I think you'll find that magic is rare in Skyrim. Winterhold, though... The College there has it in abundance. Look there if you wish to learn." He also does not seem to be fazed by the dragons and he will occasionally be heard saying: "No doubt most folk in Skyrim consider the dragons terrifying. I find them... wondrous." Erikur: "Melaran, you lazy milk drinker, have you finished studying the imports from Black Marsh?" Melaran: "Indeed I have, sir. Elven weapons for their armies, sir. Elven material, but poor workmanship, like most of what we get from them." Erikur: "Scary, thinking of those boots with an army of Elven weapons at their command. Let's be thankful they're half a world away, eh?" Melaran: "Even a fine weapon is only as good as its wielder, sir. But they should fetch a high price from the Imperial army." Erikur: "Right you are, elf! Or even from the rebels, if they've got enough money to make a competitive offer." Melaran: "As always, lord, your loyalty is a shining example to us all." The Official Game Guide incorrectly lists Melaran as an adept-level trainer in Alteration. Despite supposedly being Sybille Stentor's replacement as court wizard in the event of her death, he will not change his routine or sell anything to reflect this. When a female player character asks Melaran about the court wizard, his spoken dialogue will not correctly reflect the player's gender, although the subtitles will. When Melaran speaks to Erikur about importing weapons from Black Marsh, his spoken dialogue does not match the subtitles. This page was last modified on 20 March 2019, at 16:43.